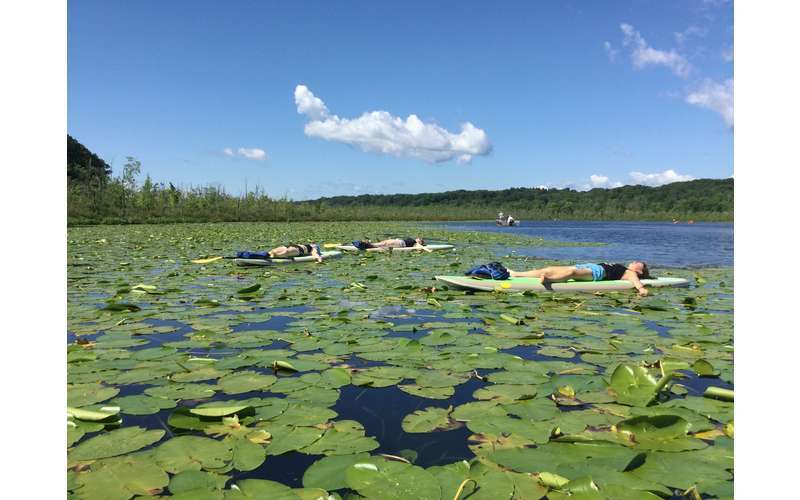 Kayak Shak offers fun, engaging SUP YOGA classes for just 35 dollars. This includes gear rental, instruction, and a wonderful floating yoga class. Classes are held every Saturday and Sunday 9am-11am from Memorial Day through Labor Day. No paddleboard experience necessary for any class. Please wear something that you can move in and also (maybe) get wet in. It is recommended that you have some yoga experience. A towel, water bottle, sunscreen, sunglasses (if that's your jam) and of course an open, playful mind! If you bring your own board the class is 20 and includes a 5 launch fee. We also offer private classes and bachelorette partles. Please contact Rhianna at [email protected] for bookings and inquiries. Please visit our website for more info! If classes are cancelled due to weather we will notify via Facebook and our www.meetup.com/kayak-shak-sup-yoga page as soon as the decision is made. Planning a girls weekend? Whether you're celebrating a special occasion or just getting together with some girlfriends, Saratoga Springs and the surrounding county of Saratoga offer a wide range of fun-filled things to do and places to visit.